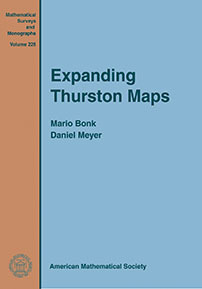 This monograph is devoted to the study of the dynamics of expanding Thurston maps under iteration. A Thurston map is a branched covering map on a two-dimensional topological sphere such that each critical point of the map has a finite orbit under iteration. It is called expanding if, roughly speaking, preimages of a fine open cover of the underlying sphere under iterates of the map become finer and finer as the order of the iterate increases. Every expanding Thurston map gives rise to a fractal space, called its visual sphere. Many dynamical properties of the map are encoded in the geometry of this visual sphere. For example, an expanding Thurston map is topologically conjugate to a rational map if and only if its visual sphere is quasisymmetrically equivalent to the Riemann sphere. This relation between dynamics and fractal geometry is the main focus for the investigations in this work. The book is an introduction to the subject. The prerequisites for the reader are modest and include some basic knowledge of complex analysis and topology. The book has an extensive appendix, where background material is reviewed such as orbifolds and branched covering maps. Graduate students and researchers interested in dynamical systems and topological dynamics. A novice reader working through this text will find a gentle introduction to these topics in a concrete intuitive setting.